Walking is great for the body, mind and soul. And if you’re a middle-aged woman, a new study finds that it may lower your risk of heart failure. (WXYZ) — Walking is great for the body, mind and soul. 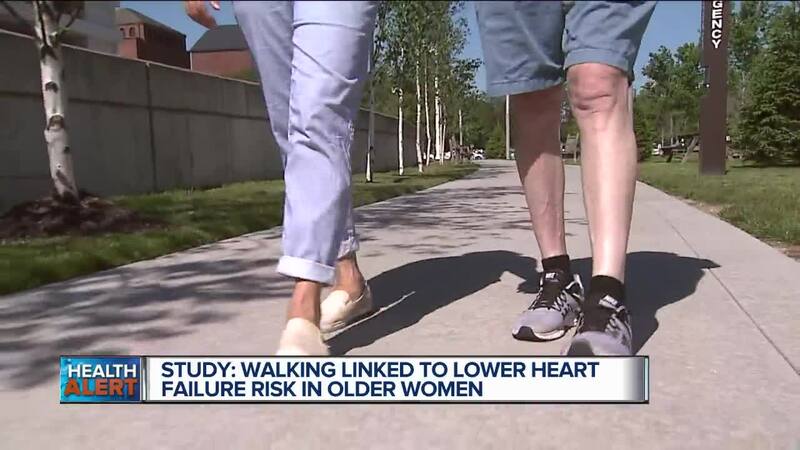 And if you’re a middle-aged woman, a new study finds that it may lower your risk of heart failure. Heart failure affects roughly 3.6 million American women. Now when you have heart failure, this means that the heart is no longer pumping and circulating blood like it should. This causes fatigue because the body isn’t getting enough oxygen, and other symptoms like shortness of breath, a persistent cough, rapid heart rate and swelling of the ankles, feet, legs or abdomen. Now new research has found that exercise can lower the risk of heart failure in middle-aged and older women. More than 137,000 women aged 50 to 79 took part in the study. And researchers found the women who exercised the most were 35% less likely to develop heart failure. Quite a few of the women in study walked, about 38%. I love recommending walking because it’s easy, doesn’t cost any money and you can do it anywhere! Know your blood pressure numbers and keep them in the normal range. If it’s uncontrolled, this can lead to heart disease. Know that coronary artery disease and diabetes can also damage the heart. If you have these, be sure to see your doctor regularly so that the conditions can be monitored. If you suffer from depression, be sure to get help. Depression is often associated with heart failure. Follow a heart-healthy diet, don’t smoke and lose weight if you need to. Taking these steps can help prevent heart failure. Heart failure is affecting more and more women. And almost 50% of all hospital admissions for heart failure are women. But if you chose to live a healthy lifestyle, this can really help you live a longer and more fulfilled life.